St. Martin's Press, 9780312571214, 464pp. 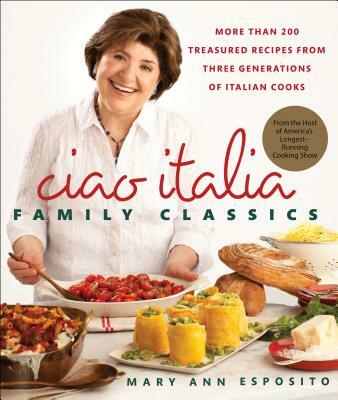 Georgeously designed with appetizing full-color photographs of recipes and homespun essays about Italian cooking and family traditions throughout, Ciao Italia Family Classics will have fans old and new pulling it off the shelf again and again. “A primer for authentic Italian cooking from the host of the long-running PBS show Ciao Italia. Esposito (Caio Italia Five-Ingredient Favorites, 2009, etc.) returns with Italian recipes both familiar and unfamiliar; her section on sauces not only includes recipes for pesto and tomato sauce, but also Salmoriglio, a Sicilian sauce made with lemon and olive oil. The author provides a helpful resource for cooks wishing to deepen their knowledge of the principles behind Italian cooking, while simultaneously broadening their repertoire of Italian dishes. Esposito begins with an introduction to "Italian Pantry Basics," a helpful encyclopedia of the ingredients that appear most often. Organized according to different main ingredients and rife with anecdotes, history and additional information about techniques, the book emphasizes local, seasonal and organic produce and meat. Even so, most ingredients can be easily found in any chain grocery store. Recipes range in difficulty but are clear and easy to follow. Readers who wish to use store-bought pasta are accommodated, as are those who want to try their hand at homemade Spinach Pasta. Most recipes are well within the range of a moderately experienced cook. Uncooked Cherry Tomato Sauce could easily be put together by a child, and Creamy Cauliflower Baked in a Mold, though requiring more skill, would undoubtedly make an impression at a dinner party.